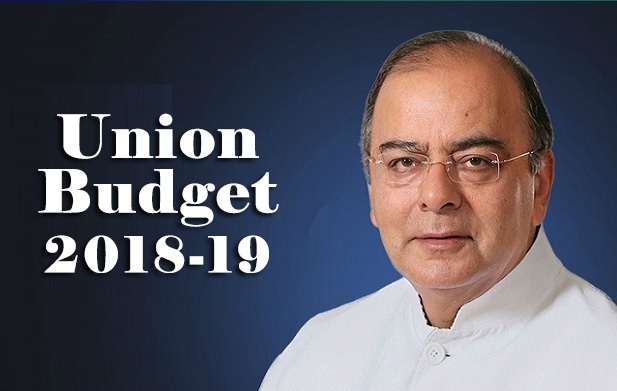 Finance Minister Arun Jaitley delivered his Budget 2018 speech, with the government focusing on the agricultural sector and farmers' income. Signalling that fiscal prudence has gone off track, Jaitley proposed a fiscal deficit target of 3.3 percent of GDP for 2018-19. The target he had set for 2018-19 last year was 3 percent. He also said the government hopes the economy will grow at 7.2% to 7.4% in the second half of 2018. 1) With demonetization, the quantum of cash currency in circulation has decreased and the tax base has increased. It has improved the digitalization of our country, says Arun Jaitley. He also added that foreign direct investment has gone up, while the GDP at 6.3% is a signal of a turnaround in the economy. 2) He added that exports are expected to grow at 15% in 2018-19 and that the government is on track to achieve 8% growth. 3) Arun Jaitley lists out major government schemes implemented in recent years. "We have worked sincerely without weighing political costs." Services being delivered to doorsteps and into accounts – this has reduced the role of middlemen and corruption. 4) After improvement in ease of doing business, finance minister says the focus is now on "ease of living". 5) This year's budget will particularly focus on strengthening the rural economy, Jaitley says. India has improved by 42 places in the Ease of Doing Business rankings. 7) Want farmers to earn 1.5 times the cost of the produce of their crops: Jaitley says on the government's promise of doubling farm incomes in five years. 8) "The government will create an institutional mechanism involving all concerned ministries so that the farmers get a better price for their produce," says Jaitley. 9) Jaitley said MSP for Kharif Crops will be 1.5 times the Cost Of Produce. 10) Jaitley proposes Rs 5 billion Budget allocation for Operation Green. 11) Cultivation of horticulture crops in clusters can boost production and marketing, says Jaitley. 12) Agri-market Development Fund with a corpus of Rs 20 billion to be set up for developing agricultural markets. 13) India's agriculture export potential is $100 billion as against today's $30 billion, says Arun Jaitley. He also added that food processing sector is growing at 8 percent. 14) Grameen Agricultural Market (GRAM) will provide farmers a means to sell directly to buyers, says Jaitley. 15) Jaitley says allocation to food processing industry doubled to Rs 14 billion (1,400 cr) from Rs 7.15 billion (715 cr). 16) Finance Minister Jaitley proposes to extend Kisan credit card to fisheries and animal husbandry farmers. 17) The government will focus on spending more on livelihood, agriculture and rural infrastructure, says Jaitley. This will get Rs 14.34 trillion (lakh crore) from budgetary and non-budgetary resources. 18) An amount of Rs 160 billion will be spent on providing electrical connection to nearly 40 million (4 crores) poor households. 19) For education sector, the government proposes revitalizing infrastructure, opening schools for the ST populations as well as promoting programmes for teachers, in order to improve quality education for students. 20) Jaitley says 80 million (8 crores) poor families will be given free gas connection. 21) Jaitley says the government aims to build 20 million (2 crores) toilets. 22) Finance Minister says government to allocate Rs 26 billion (2,600 crores) underground water irrigation plan in 96 districts. 23) Jaitley announces National Health Protection Scheme. Amount of Rs 500,000 per year per family for 100 million (10 crores) families will be allocated, Jaitley added. Jaitley says the scheme to have approximately 500 million (50 crores) beneficiaries. 24) Jaitley announces govt to bring in Ayushman Bharat Programme, a move towards universal health coverage. Jaitley announces the additional allocation of Rs 6 billion (600 crores) for nutritional support for tuberculosis patients. 25) Jaitley says Pradhan Mantri Jeevan Jyoti Bima Yojana (PMJBY) to be expanded to all poor households. 26) Jaitley says an amount of Rs 3 trillion (lakh crore) set aside for Mudra accounts. 27) Jaitley says government to allocate Rs 1.38 trillion (lakh crore) in FY19 for government health and education programmes. 28) "Contribution of 8.33% to EPF for new employees by the government for three years and 12% government contribution to EPF in sectors employing a large number of people. Women employees' contribution to EPF to be reduced to 8% from 10% for the first three years," announces Jaitley. 29) A hundred thousand (1 lakh) gram panchayats have been connected to high-speed broadband. Jaitley allocates Rs 100 billion (10,000 crores) to set up 500,000 (5 lakh) Wi-Fi hotspots to provide broadband access to 50 million (5 crores) rural citizens. 30) BS VIEW: Sebi may mandate large firms to meet 25% of their debt needs from the market. Move to widen the corporate bond market, but is mandating by Sebi a good idea? 31) The government does not recognize cryptocurrency as legal currency and will take all steps to curb illegal transactions using cryptocurrencies. 32) The finance minister proposes two defense industrial corridors in the country to promote domestic production in both public and private sectors. 33) Niti Aayog will establish a national programme to direct efforts towards artificial intelligence, including research and development of its applications. 34) Emoluments of the President to be revised to Rs 500,000 (5 lakh), Rs 400,000 (4 lakh) for the Vice-President, and Rs 350,000 (3.5 lakh) for governors: Jaitley. 35) Jaitley proposes a fiscal deficit target of 3.3 percent of GDP for 2018-19. The target he had set for 2018-19 last year was 3 percent. All Market yards in Telangana to be integrated with e-NAM Bin Zayed Group to invest 12,500 crores in Telangana Uttarakhand government launched CM dashboard on the . . . . Telangana chief minister K Chandrashekar Rao Declares . . . .